debut alone. Another genre of adventure fiction was ripe for parody just then — the super-secret yet flamboyant espionage agent, epitomized by James Bond (only commercially related). Both parodies were first seen in The World of Atom Ant & Secret Squirrel, a prime-time special that aired Sunday, September 12, 1965, on NBC. Both Atom and Secret were on the regular Saturday morning schedule as of October 2 of the same year. They shared an hour-long show imaginatively titled The Atom Ant/Secret Squirrel Show. It was a scaled-up version of the half-hour shows Hanna-Barbara had been doing up until then, where the title character got one segment and two more were used for lesser stars. Twice as much time and twice as many protagonists meant twice as many back segments. The four lesser stars were Squiddly Diddly, Precious Pupp, Hillbilly Bears and Winsome Witch. Later, it split into two half-hour shows, and Winsome and Squiddly were packaged with Secret's portion. Later still, they were reunited. Altogether, the show(s) ran three seasons, a total of 39 episodes (each). Secret Squirrel, aka Agent 000, was voiced by Mel Blanc, the man behind Foghorn Leghorn, Pepe LePew and Marvin Martian, to say nothing of Bugs and Daffy themselves. Secret wore his hat furtively low, which would have been a barrier to seeing if he hadn't cut eyeholes in the brim. Both the hat and his trenchcoat were bristling with the sort of devices those flamboyant secret agents always carried, just like those of the later Inspector Gadget. Secret's fez-wearing sidekick, Morocco Mole, was Paul Frees, another giant in the field of voice acting, whose many roles include Ludwig von Drake, Crawford Crow and Bullwinkle's Boris Badenov. Frees modeled Morocco's voice after that of actor Peter Lorre, but used Sidney Greenstreet as his model for the voice of the main recurring villain, Yellow Pinky (a parody of James Bond's Goldfinger). The man who gave Secret and Morocco their assignments was Double-Q, also voiced by Frees, this time modeling his performance after the style of Eric Blore. Secret Squirrel appeared in his share of merchandised items, such as toys and lunchboxes, but only in one comic book that came out while the series was running. Gold Key released it with an October, 1966 cover date. Winsome Witch and Squiddly Diddly appeared in its back pages. Years later, tho, when Archie Comics was the Hanna-Barbera licensee, Secret shared billing with his old partner, Atom Ant, in the first issue of Hanna-Barbera Presents (November, 1995). 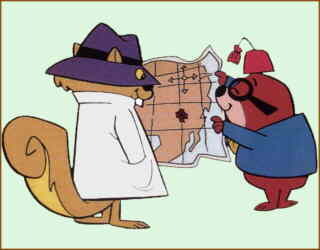 Secret Squirrel was later part of the cast of Yogi's Gang, one of several '70s shows Hanna-Barbera did to keep its trademarks from falling into disuse. And in 1993, he was revived for a regular gig, as star of the back segment in Hanna-Barbera's 2 Stupid Dogs. There, he was voiced by Jess Harnell (Wakko Warner), Morocco by Jim Cummings (Taz) and the Chief by Tony Jay (Shere Khan in TaleSpin). Since then, Secret and Morocco haven't been seen very often, unless you count an occasional unauthorized guest appearance such as his attempt to provide intelligence on weapons of mass destruction in a February, 2004 episode of Tom Tomorrow's This Modern World. But the very existence of such unauthorized guest appearances indicates the public still recalls him. Maybe the owner of the property (currently AOL Time Warner) will someday see commercial use in him again. Text ©2004-09 Donald D. Markstein. Art © Hanna-Barbera.